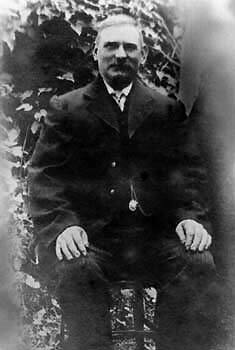 This is one of only four extant photographs of Josiah, who refused steadfastly to be 'photo-ed' until he was well into his sixties because of a fixed belief that it would steal away his soul. In his business dealings he suffered under lifelong anti-Semitic prejudice, notwithstanding that he wasn't Jewish. However his protestations as to his Anglo-Saxon ancestry fell upon deaf ears among those convinced by such an apparently Jewish surname. In fact his mediaeval forebears had been fishmongers whose frequent marketing cries of "salmon and trout" had been first adopted, and then later corrupted, as a patronymic epithet by their contemporaries. Thus, the Domesday Book contains the entry: 'Jenwald Salemane-Troutte holds land from Geoffroi de Caen ...' . Josiah had these details printed in a pamphlet which he handed to new acquaintances along with a cigar and a putty catalogue, but still he could not gain admittance to White's Club. Those inside raised their glasses in jeering toasts of derision, hurled ribald remarks through the windows and told him to seek the company of his 'sheeny friends like Disraeli'. Josiah was left to fume and expectorate on the pavement. Increasingly bitter and vicious he sought refuge in the manufacture of miniature cigar boxes, none of which was over an inch in length, and to which pursuit he devoted almost eighteen hours a day for over thirty years. Eventually he died.